Are you looking for a weekend campout destination? 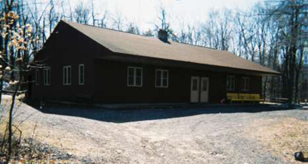 Centrally and conveniently located in the heart of the Poconos, Camp Minsi has a variety of year-round camping options for your unit. 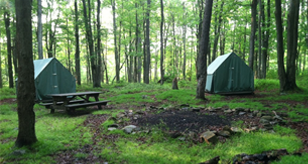 To make a reservation, use our online Weekend Camping & Facilities Rental reservation system; or call the Minsi Trails Council's Camping Secretary at 610-465-8568 for assistance or more information on camping at Camp Minsi. 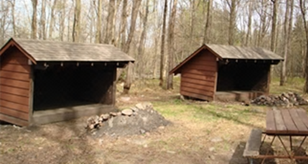 Camp Minsi's Adirondack shelters provide a rustic camping experience for Scouts. The four shelters can hold approximately four Scouts each. The site includes reflector fireplaces, picnic tables, and a nearby latrine facility. Weytrex Cabin is a dual-sided cabin facility (side A and side B). Each side sleeps 19 Scouts with bunk beds and includes a bathroom with a shower. The cabin has wood heat stoves in addition to gas heat and electric lights and receptacles. Kitchen areas include refrigerator/freezer, sinks, stoves, and countertops. Outdoor areas contain fire pits and picnic tables. 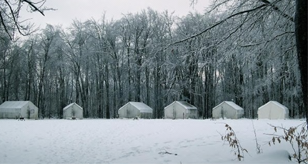 Camp Minsi's Winter Tents provide a unique winter camping experience. These large, walk-in wall tents sleep 8 Scouts. Each of the eight tents is equipped with wood stoves that make the tents cozy even in the coldest weather. Tents are on raised platforms and equipped with bunk beds. The Winter Meal Lodge (summer nature lodge) is available as a cooking and dining space for units using the Winter Tents. Camp Minsi has a variety of campsite facilities for traditional tent camping; this includes the camp’s 10 centrally located summer camp sites, plus 3 lakeside short-term sites. Bring and pitch your own tents; each site includes fire rings, picnic tables, and latrine facilities (water is available, but it is turned off in the sites from mid-October through April. Make a reservation at www.minsitrails.com today.